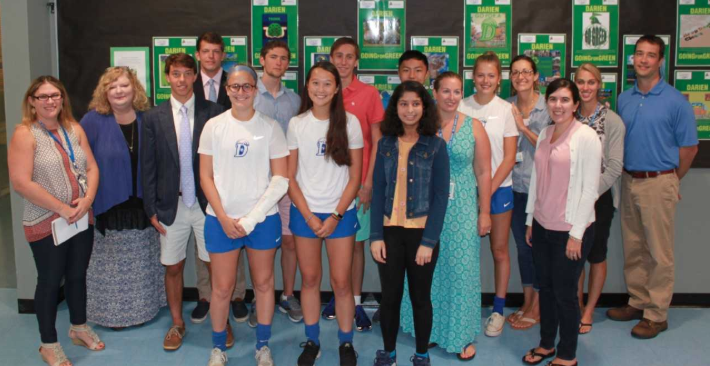 Nine Darien High School seniors have been named National Merit Scholarship Program semifinalists with an opportunity to compete for scholarships in the spring. The DHS seniors are Blake Cellar, Sophia Cortellesi, Ria Dhull, Cole Hanson, Taylor Richards, Aram Russell, Cason Stone, Evan Tong and Olivia Yoo. Nationwide, the National Merit Scholarship Corp. has named about 16,000 semifinalists who can compete for 7,500 scholarships with a total value of $31 million. Over 90 percent of the semifinalists are expected to attain finalist standing, and about half of the finalists will win a National Merit Scholarship. Today officials of National Merit Scholarship Corporation (NMSC) announced the names of approximately 16,000 Semifinalists in the 64th annual National Merit Scholarship Program. To be considered for a Merit Scholarship award, semifinalists must fulfill several requirements to advance to the finalist level of the competition. Over 90 percent of the Semifinalists are expected to attain Finalist standing, and about half of the finalists will win a National Merit Scholarship, earning the Merit Scholar title. Over 1.6 million juniors in about 22,000 high schools entered the 2019 National Merit Scholarship Program by taking the 2017 Preliminary SAT/National Merit Scholarship Qualifying Test (PSAT/NMSQT), which served as an initial screen of program entrants. To become a finalist, the semifinalist and his or her high school must submit a detailed scholarship application, in which they provide information about the semifinalist’s academic record, participation in school and community activities, demonstrated leadership abilities, employment, and honors and awards received. A semifinalist must have an outstanding academic record throughout high school, be endorsed and recommended by a high school official, write an essay, and earn SAT scores that confirm the student’s earlier performance on the qualifying test. From the approximately 16,000 Semifinalists, about 15,000 are expected to advance to the finalist level, and in February they will be notified of this designation. All National Merit Scholarship winners will be selected from this group of finalists. Three types of National Merit Scholarships will be offered in the spring of 2019. Every finalist will compete for one of 2,500 National Merit $2,500 Scholarships that will be awarded on a state-representational basis. About 1,000 corporate-sponsored Merit Scholarship awards will be provided by approximately 230 corporations and business organizations for finalists who meet their specified criteria, such as children of the grantor’s employees or residents of communities where sponsor plants or offices are located. In addition, about 180 colleges and universities are expected to fi nance some 4,000 college-sponsored Merit Scholarship awards for finalists who will attend the sponsor institution.